﻿Be they round, oval, square or rectangular, Morganites are a big hit in Stonechat Jewellers! 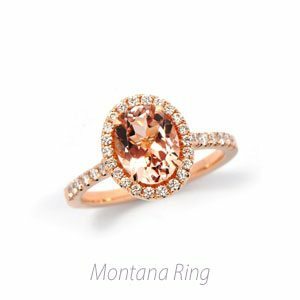 Morganite, I hear you say – what on earth is that? 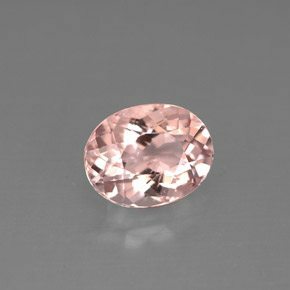 A Morganite is a precious gemstone, with the softest of hues. It is peachy pink in colour, and warm in nature. It looks soft and kind and graceful. It doesn’t clash or fight. It complements and highlights. The rosy tones gently lift, ensuring any piece of contemporary jewellery set with a Morganite is extremely elegant. Originally called a “pink emerald” as it’s from the same beryl family as the well-known green stone, Morganite can be found in Brazil and Madagascar, amongst other countries. The unusual name came about in the early 20th century when a noted gemologist named it after JP Morgan, the wealthy US banker and gemstone collector. Focusing on complementing colours, a Morganite radiates when set in 18ct rose gold, where the pinky colour of the metal brings out the lightness of the gemstone. Adding diamonds, like in our Emelie Morganite ring, brings a shot of white to the party, contrasting wonderfully. Similarly, mixing metals, such as rose gold with silver or white gold, can add another dimension too. With a hardness of 7.5 to 8 on the Mohs scale, the good news is that Morganite wears well extremely well in engagement rings, as well as in day or occasion pieces of jewellery. As with all diamonds and precious gemstones, looking after your Morganite is really important. We recommend removing jewellery when doing any heavy duty work, and keeping it away from all creams, perfumes and moisturizers which will dull down all stones. Believe it or not, wearing your ring while doing the dishes is highly recommended – warm water and washing up liquid do wonders for keeping grime and build up to a minimum. In addition, an occasional gentle scrub with a small toothbrush will keep your ring looking fresh and bright. 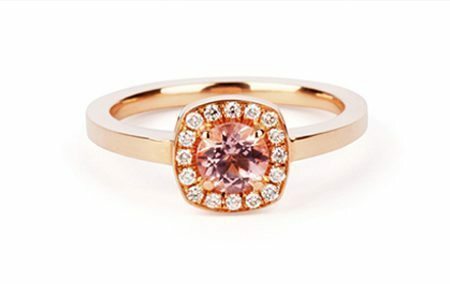 Pop into our shop in the Westbury Mall in Dublin 2 to see various pieces of jewellery set with Morganite, ranging from a large, striking Morganite Cocktail ring to the beautiful Emelie Morganite which has a cushion shaped setting, surrounded with a halo of white diamonds. Alternatively, the Lika Morganite ring is the ultimate in edgy and dashing, while the Montana Morganite ring hints at how sometimes size really does matter! Prices range from €780 to €3600 euro for the rings mentioned above and we’d be delighted to show you these pieces and discuss possibilities with you. It’s worth bearing in mind that you are by no means limited to these designs, shapes and sizes – we’d love to hear what you have in mind and talk through ideas for this truly beautiful, gentle gemstone. A Remodelling Project – The Family Ring Remodelling – From one old to many new!